Host your own black-tie event with the help of these Black-Tie Insta-Theme backdrops and props. This goes great with Hollywood theme parties, awards night ceremonies, or Vegas themed ball decorations. Start with the Black-Tie Ballroom Backdrop, along with the Black-Tie Ballroom Floor Backdrop, then add any prop you wish. This is a great prom black tie theme. You may also like the Casino Insta-Theme for all of you high-rollers. Roll out the red carpet for your guest with the Black-Tie Insta Theme collection. This room decoration is very popular with people who are throwing Hollywood and awards night parties. You can also use it for casino and Vegas themed parties or any other formal party themes. Don't forget to check out all of our Hollywood theme party supplies to make your party a success. This background is perfect for prom black tie themes or if you want a red carpet scene setter. Setting up this insta theme is a snap. 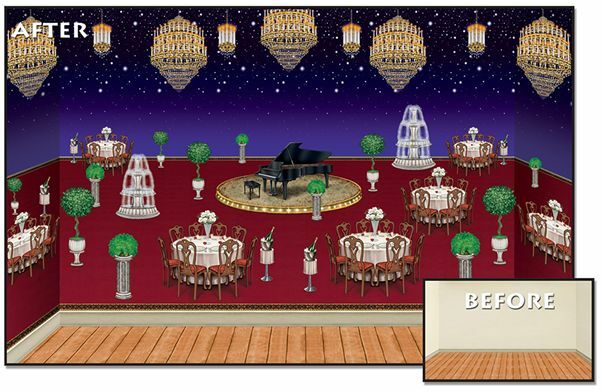 Simply attach the Black-Tie Ballroom Floor Backdrop to the lower half of your wall. It looks like a rich dark red carpet. Next attach the Black-Tie Ballroom Backdrop to the upper half of your wall to recreate the look of a royal dance hall. Together, these two backdrops will cover a wall eight feet high. They are easy to work with and can be fastened with almost any kind of tape or even push pins. Add the props to make the Insta-Theme come to life. Like the Black-Tie Lighting Props that add some elegance to the background.